Marianne says, When in Prague, be sure to stroll across Charles Bridge, admire the spectacle of the Astronomical Clock, sample Pilsner Urquell at Old Town Square. Prague may not be Milan or Paris still the city has a large selection of shops; from international chain stores to quirky boutiques, from shopping malls to second-hand stores . Na prikope and 28 Rijna are Prague's most popular shopping streets. You will find here Zara, Benetton, Jackpot & Cottonfield and many more favorites. These two streets together with neighboring Wenceslas Square make shopping in Prague pleasure. Start you shopping day at Palladium, a modern shopping center brimming with 180 shops and 20 restaurants. You will have no trouble in spending here a pleasant afternoon, maybe even a full day. The Famers' Market is just opposite Palladium. The place to be if you like local honey, Moravian wine or homemade sausages. Are you a second Imelda Marcos? Be sure to visit the Bata Shoe Store at Wenceslas Square: five floors chockfull of trendy shoes and fashionable bags. One a rainy day, Palac Knih Luxor guarantees several hours of browsing books and magazines. In Myslbek shopping center you will Bibelot, a shop entirely devoted to pens from Parker to Mont Blanc. But if it is natural cosmetics you are after, visit Korres a shop that specializes in Greek beauty products. The following list of 10 best shops in the Nove Mesto district may help you decide where to go first. Five floors brimming with 180 shops and 20 restaurants a true Mecca for shoppers. Palladium is not only a shopping paradise,its architecture is also impressive. The building used to an army barracks which had been neglected. Palladium Shopping Center opened in 2007 retaining its old façade. This mall is now very popular because of its 200 shops and central position. Not only will you find here international chain stores including Marks & Spencer, H&M, Estee Lauder but also an Albert supermarket and fast food outlets. At Christmas and Easter you will find the Christmas and Easter market in front of Palladium, selling local food and drinks besides handcrafted goods. With over 30 shops, Myselbek shopping Center is paradise for shopaholics. Built in 1996, it was one of the first shopping malls in Prague. This modern glass building blends well with the classical facades of the other houses and shops in Na Prikope street. 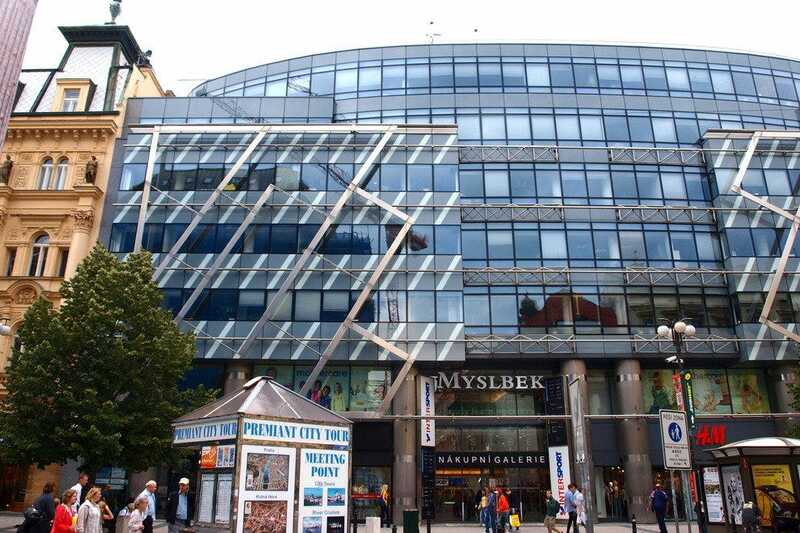 The shopping center is named after the sculptor Josef Václav Myslbek. You will find in this mall well-known chains such as H&M, Instersport, Calvin Klein and many more. Shopping made you hungry? Umami Sushi will seduce you. If it is only fresh fruit juice you crave,Fruitisimo is the place to be. After many years of eating too much meat and not enough vegetables, Czech people have now discovered the benefits of the Farmers Market. They are scattered through Prague, but the market at Namesti republiky is very central. As a visitor you can easily skip the fresh vegetable stands, but the fruit stalls may be just what you were looking for. Who can resist fresh strawberries, blackberries or plums. There are several stall entirely devoted to honey. Why not take home a jar or two or beeswax candles in the shape of a bear. If you don't feel like buying anything, sit on the wooden benches and sample some gourmet coffee with sausages. Second-hand Bazar CD brims with and DVDs LPs. You will certainly go home with something to your liking. Rummage through thousands of titles and you are sure to find that very special LP or cassette you have been wanting to have for ages and could not find anywhere. When you are shopping on Wenceslas Square, Bazar CD is only a short detour. 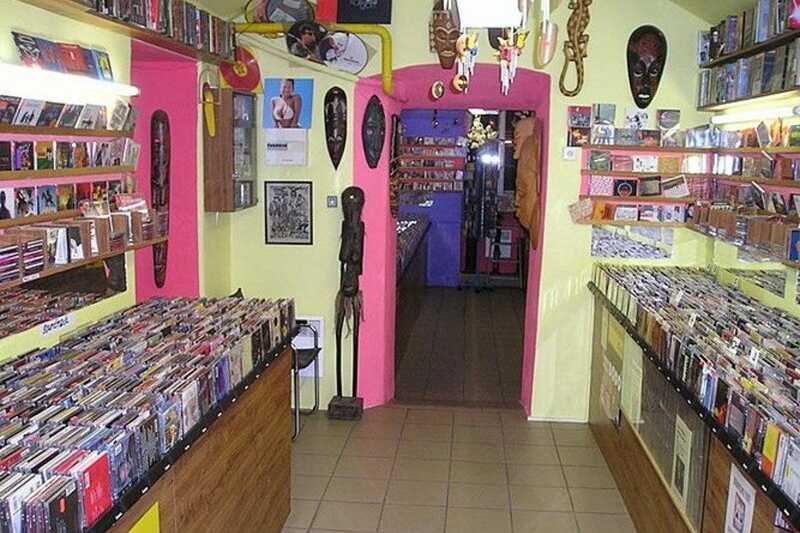 With 20,000 titles in stock, it is the largest second hand music store in Prague. You will find here not only the Beatles, the Rolling Stones or Elvis Presley but also operas and in particular those from Czech composers: Bedrich Smetena, Antonín Dvorák and Leos Janácek. 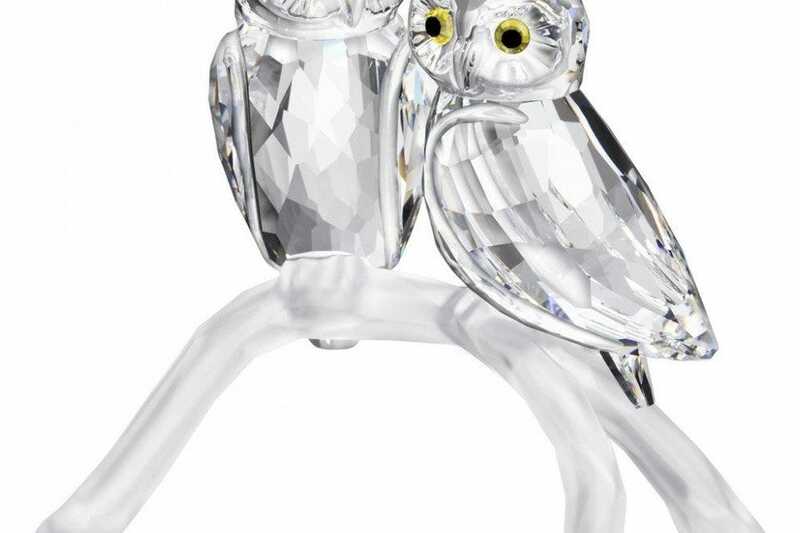 With three shops in Prague, two in Stare Mesto, the Old Town, and one in Nove Mesto, the New Town, and several more in Prague's many shopping centers, you cannot miss the world-famous brand Swarovski. Although Swarowski's headquarters are in Austria, the founder, Daniel Swarowski was from northern Bohemia. He invented a revolutionary way to cut glass using hydroelectricity which made it possible to cut glass in a special way. The shop specializes in eye-catching crystals sculptures, accessories, stemware, chandeliers. The sparkling crystals in the shop and shop window are hard to resist and make excellent presents to take home. 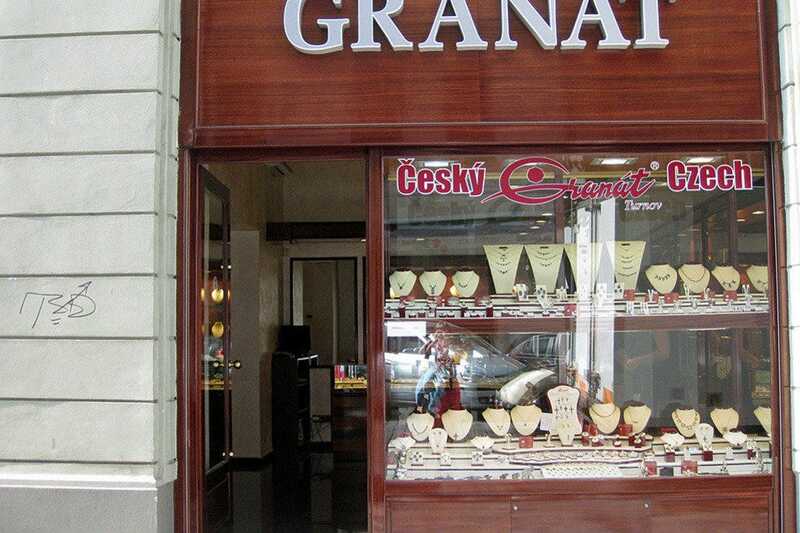 Cesky Granat Turnov is one of the many shops in Prague selling dazzling, dark red garnets. This semi-precious stone comes from mines in the Czech Republic. Shop windows in the historic center brim with garnets in all sizes and shapes. The jewellery is mostly classic of design and looks as if it comes straight from grandma’s inheritance. A plethora of shops in Stare Mesto and Nove Mesto stocks this semi-precious stone in the form of earrings, pendants, cufflinks, rings, necklaces and bracelets. It is difficult to decide which shop to favor because the ruby red stones set in gold or silver all look very similar. Many shops sell garnets imported from India. They look exactly the same, but if you want to have Bohemian garnets, Granat Turnov is a trusted shop to buy them. Every garnet is accompanied by a certificate of origin. The Prague branch of Dorotheum is the most important auction house in the Czech Republic. 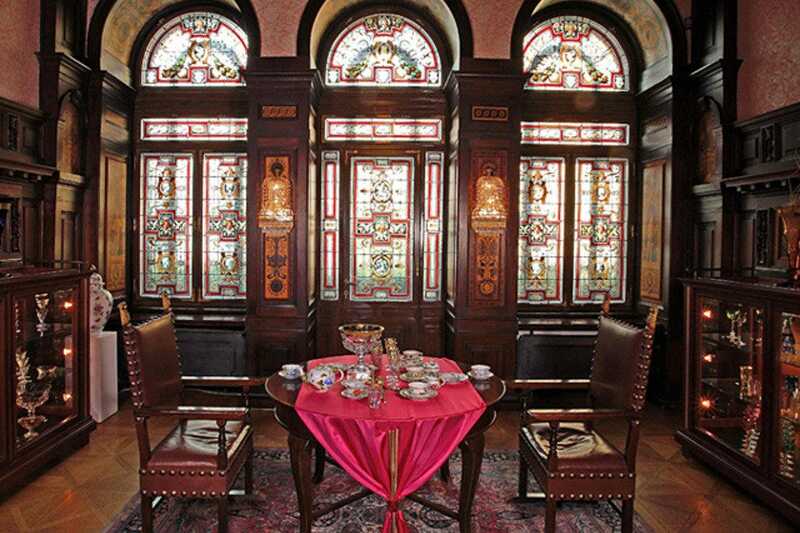 But it is also a gallery shop with all manner of Victorian-era and Art Nouveau jewelry, Bohemian glass, antique silver. oil paintings, water colors, period furniture and decorative objects. This is a shop to browse and maybe to buy if your budget allows you. It will take you down memory lane and may make your antique dreams come true. Four times a year you can attend art auctions which are held in the Renaissance Hotel. The auction are in Czech but prices are presented in crowns and euros. Palac Knih Luxor occupies a prime location on Wenceslas Square. This Mecca for booklovers has four floors crammed with books, a guarantee for a few hours of browsing. This welcoming shops stocks everything from comics to historical novels and from Prague history books to romantic fiction. If you have used up all your reading material, Luxor stocks a wide selection of English best-sellers books translated from Czech on the lower ground floor. 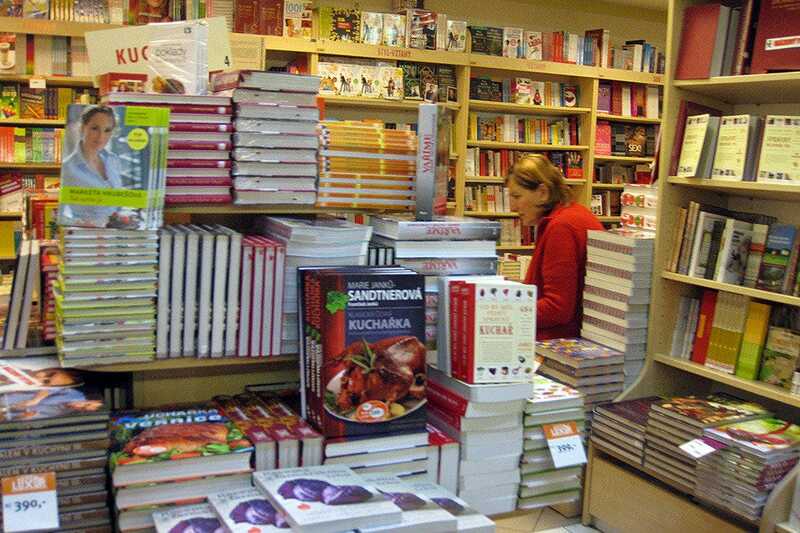 You will find new releases on the ground floor as well as Czech and foreign newspapers and magazines, travel and cooking. The caf�n the first floor is an excellent spot to enjoy a cappuccino with honey cake while you leafing through your newly bought books. Moser means Bohemian crystal. The shop sparkles and glows with splendid drinking glasses, carafs, vases, ashtrays and all sorts of other decorative glassware. Each item on display is more beautiful and flamboyant than the next. 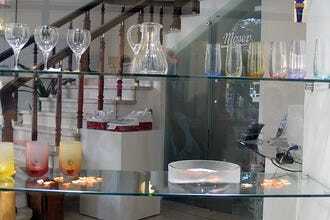 The Moser shop in Na Prikope street is the flagship of the prestigious glass blowers dynasty of Karlovy Vary. Lead is an important component of crystal. It makes glass strong but it is also a health risk for glass blowers. Ludwig Moser succeeded in manufacturing lead-free crystal that was as strong as leaded glass, an invention that made working conditions for the glass blowers safer and healthier. 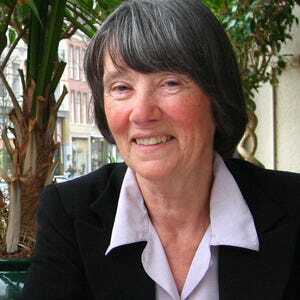 Marianne Crone divides her time between her home in the Netherlands and an apartment in Prague, the city where her son, daughter-in-law and grandson live.